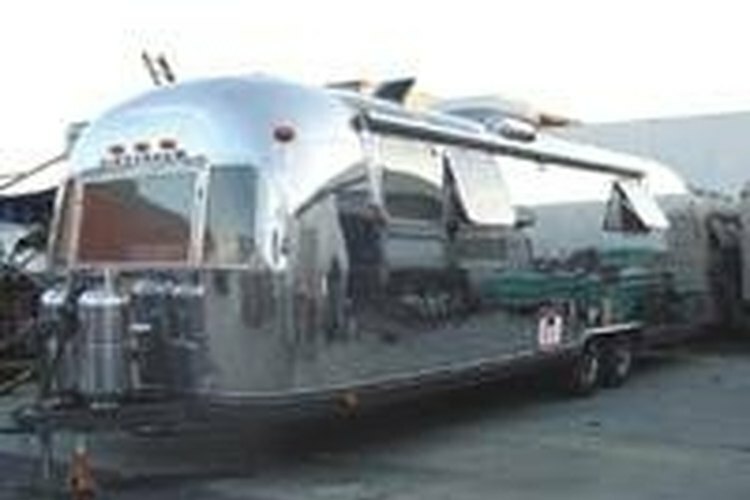 The shape and silver color of lightweight Airstream trailers was inspired by aircraft design. The founder of Airstream, Wally Bryan, said his trailers "cruised down the highway like a stream of air," hence the name. Restoring a trailer can be an expensive proposition but there are plenty of resources available because vintage Airstreams are so popular. If you're good with tools you can do most of the work. Hire professionals for jobs that are beyond your skills. Check the trailer for structural damage. Repair of replace rotted wood and floors. Replace framing as needed. Test the electrical systems and plumbing if they're present and have a professional do repairs if you aren't skilled in those areas. Take off any parts that were added to the trailer and not consistent with the design of an Airstream. Repair damage like screw holes that happened when the aftermarket parts were added. Clean the water system including the black and gray water tanks. Fill them and then check them for leaks. Repair leaks and then pour bleach into the system with bleach to remove mold and bacteria. Flush the system with clean water until you can no longer smell bleach. Test the refrigerator and furnace. If you smell garlic, there's probably a propane leak somewhere in the system. Try to isolate the leak by putting soapy water where you believe it might be. The water will bubble if there's a leak. Clean the interior of the trailer. Use warm, soapy water to clean veneers. Polish stainless steel and repair pits and scratches. Use a carpet cleaning machine on the upholstery and carpet if it's original to the trailer. Replace them if they aren't. Fix rust spots on the exterior of the trailer. Replace damaged propane hoses and connections. Replace missing trim. Repair the entry steps, locks and window seals. Test the stabilizing jacks and replace them if necessary. Look for replacement parts in salvage yards and vintage trailer magazines. Advertise for hard to find parts. Airstream trailers frequently had wide wooden blinds as window coverings. Make sure the trailer is well ventilated when you check for propane leaks.